Posted on October 21, 2018 by John Lage, Jr. I read a lot of theological based material these days. It makes me think. This morning I ran across this article that spoke to me. Please take a few minutes to read it. My wife and I have intentionally and dramatically cut back on gifts (aka things) to friends and family. The reasons are partly financial as our income dropped like a rock when we answered God’s call to come and serve here in Guatemala, but we do it primarily because the vast majority of people in North America have far more things that they could ever possibly need but they always seem to want more. Within our own lives, we fight this same battle against the desire for more things even in our greatly simplified life here in Guatemala. The alternative we offer is the gift of our presence. In the case of our family and friends, it is our once a year journey home to spend time with all those we love. Here in Guatemala, it could be attending a funeral of someone we never met to show our love and concern for the still living friend or relative who is hurting so badly in this moment. 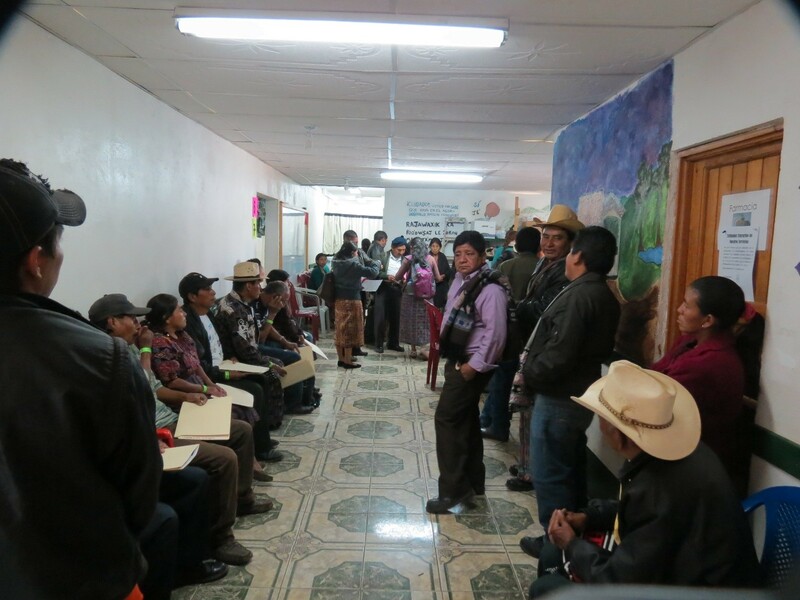 It might be sending invoices to teams without whose income our Project Salud y Paz ministries around healthcare and education for the economically poor indigenous population of this beautiful country would not exist. It might be listening to the incredible stories of faith and discipleship from those who have so little. It’s sad to say but some do not see the value of presence, still desiring things that they can touch and hold. There are times when what we are doing here seems to be nothing but a drop in an enormous bucket. It can be overwhelming and it can be demoralizing. It is then that I try to see that to the Guatemalans we serve and to those we work alongside, our presence may be just what they need and indeed may be God’s face in this world at that moment. There are also many times when their presence is exactly the same thing for me. The author of this article correctly understands and says so much more elegantly than me that presence and listening are sometimes so much more important than trying to identify and fix what we think is wrong. Be “present” for someone today As I reread what I wrote here, I was struck by the realization that the “presence” concept we’re talking about here is a lot like what God gives each of us through prayer. We only have to choose to share. May you feel and recognize God working in your life today and always! Posted on December 25, 2017 by John Lage, Jr. This is the time of year when, first and foremost, we remember the coming of God’s son, Jesus, whom Matthew 1:23 also describes as Emmanuel, meaning God with us. I believe that God is truly with us, each and every day, often in the faces of those around us! We have been fortunate enough to see and recognize this truth many times in 2017. For us, 2017 was a good year! Our ministry here at International Hands in Service/Project Salud y Paz is led by a new Executive Director, Kristen Rinaldi, who has pointed our organization back in a more positive direction through an attitude of servant leadership, a desire to work together in ministry with the Guatemalan Methodist Church, and recognition that each person we treat, work with and meet in our journey is a child of God. Our clinics saw and treated over 6100 patients this year with many hundreds more being seen in our rural medical clinics. We hosted 29 teams with more than 400 individuals serving as short-term construction, surgery, medical and dental volunteers this year and expect similar numbers in 2018. We need general and eye surgery teams for 2018. Wouldn’t it be wonderful if Rochester could send a surgery team too? Kristen was able to negotiate a new 20-year lease with the church for the two clinic buildings we have built over the years. Considering the state of the relationship between the two organizations when she arrived, this is a major accomplishment. We are quite pleased to tell you that we will be joined in February by Nikki Gensmer, the 6th long-term volunteer from Christ UMC, Rochester. Nikki will serve as the team coordinator for Project Salud y Paz in 2018. We are blessed as we continue to feel God’s call to serve here in Guatemala and our work is going well. Jan has been instrumental in improving our ability to track and report on the financial status of the organization, and in assisting Kristen’s learnings about the day to day clinic operations. My work on the pharmacy system included adding a new ordering module that uses historical data to forecast the needed medications for our clinics and rural teams. We used it in August to make a med order from the US through Blessings International, which we picked up last Sunday on the other side of Guatemala City at our shipper, Vine International. John Edmund continues his high school education at Atitlan Multicultural Academy, where he also volunteers as the Director of Technology and where he wants to complete high school. 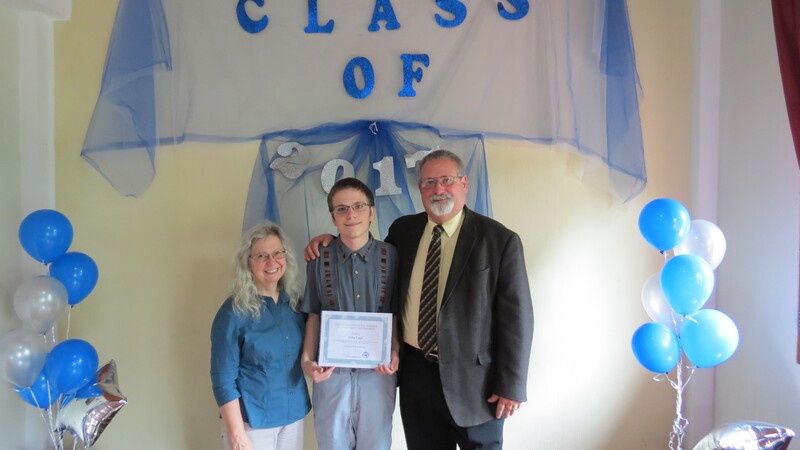 A highlight for him this year was his PSAT score which was 50 points shy of a perfect score, qualifying him to apply for a National Merit Scholarship. He has started to think about college and our trip to the US this summer will necessarily include time spent looking at colleges. Please say a special prayer for our friend, former Operations Director, Juan Toj and his two boys Marcos and Jason. They’ve had a really rough year with the passing of Manuela (Juan’s wife) and the loss of his job at Salud y Paz as well as some other challenging problems. Merry Christmas and may you feel and recognize God’s hand in your life today and always! Jan, John Edmund and John Lage, Jr.
Below I’m including a Christmas song I wrote in 2011, I hope you enjoy it! This song was written Monday morning after driving back from Indiana for most of the night. We were returning from our Christmas gathering with my family. The first two lines of the chorus came to me while I was still in bed. I got up to write them down and my wife asked, ‘Another song?’. The premise behind this song is that somehow this whole Christmas story just doesn’t make a great deal of sense from a human standpoint, but we must assume that it does make sense from God’s point of view. God’s ways are truly not our ways! God’s love is amazing and unbelievable, yet I know for sure that he is working in my own personal life! God bless you in the Christmas season! May you feel and recognize God’s hand in your life today and always! Copyright December 19, 2011 John Lage, Jr. All rights reserved. Posted on November 6, 2017 by John Lage, Jr. This was submitted to our church’s newsletter for October 2017. 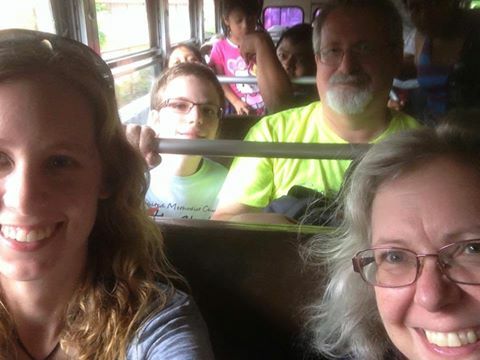 In 2013, our family traveled to Guatemala so our son, John Edmund, could be exposed to the country and the culture for the first time as he was too young to accompany us on the CUMC mission trips. One of the memorable things for me on that trip was getting to participate in the morning devotions at the Project Salud y Paz Clinic. They were in Spanish so I didn’t get too much out of the words, but the experience of being a part of this public ritual, with the patients literally waiting to see the doctor in the next room within hearing distance(as shown above), while the entire staff listened to a local Methodist pastor, Pastor Sebastian, lead us in hymns, give a short message, and end with a heartfelt prayer, always felt so very right. Due to a breakdown in relations between Project Salud y Paz and the Guatemalan Methodist church, those devotions stopped in early 2016. 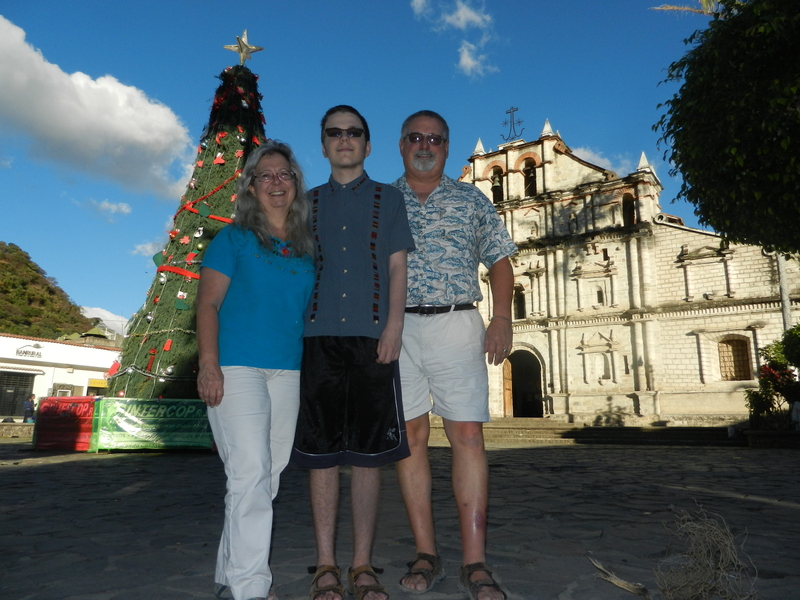 Jan and I continued to greet Pastor Sebastian enthusiastically whenever we saw him. I’m pleased to say our new executive director, Kristen Rinaldi, has placed a high priority on restoring the relationship with the Guatemalan Methodist Church and she is having success in these efforts. As a result, weekly devotions with Pastor Sebastian have begun again! There had been 25 small Spanish hymnals in the clinic previously but they had been misplaced as things were moved around during the almost two years in which they weren’t being used. Jan and I tried to find them, more for use by our short and long-term volunteers, as most of the Guatemalan Christians know all the hymns by heart. We were unsuccessful but Pastor Sebastian kept asking about them. I returned only 9 of them to him last month after finding them on a bottom shelf in the patient pharmacy, of all places. This small and gentle man gave me a huge hug and he smiled the biggest smile you ever saw. When we used them again for the first time, the hymn he chose was Holy, Holy, Holy. The devotions were indeed Holy. May you feel and recognize God moving in your life today and always! Posted on July 8, 2017 by John Lage, Jr.
And we are looking forward to celebrating with you soon as we will be arriving for a visit on July 12th after nearly a year of being away. We will begin in Rochester, but will also visit family in Indiana and Michigan. John is looking forward to attending his class reunion in Paw Paw, Illinois (we’ll let you guess how many years). It will be a visit filled with joy and connections. And then, we will be returning to Guatemala on August 18th but we hope to see as many of you as we can while we are stateside. This past year has seen many changes come to our country, to our world, and in our personal lives. It has been difficult to deal with many of these changes as they prove, at least to us, that our country is not where we thought it was. Issues regarding civil rights, climate change, immigration and healthcare makes us wonder where our current leadership is taking us. Seeing the current climate of fear and hate saddens us deeply. Yet, in the midst of it all, our family is keenly aware of God’s presence and guidance in our lives. Here in Guatemala, we live in the midst of extreme poverty, yet the people here firmly believe God will and does provide for them. We share that belief in good times and bad. For us, some changes in the past year have been very good. Our son, John Edmund, has found a school that suits him. He has expressed a desire to finish high school here in Guatemala and, after much prayer, we have decided to do our best to accommodate this request. We have also learned that Project Salud y Paz will have a new executive director and we are praying that she will lead us in new directions that will help us to better serve our neighbors in this primarily Mayan area. We invite you to join us in a Forum on Sunday July 23rd at 10:10am at Christ United Methodist Church where we will share how God’s call in our lives has changed us through the last 2½ years. We eagerly look forward to spending time with you. We will share more about Project Salud y Paz and how it continues to evolve to best serve the people of Guatemala. We will talk about people who work shoulder to shoulder with us, that live in conditions rarely found in the US since the 1800’s. You will hear us thank God for the opportunities he has given us to answer his call to serve. We will ask you for your constant prayers and for you to consider providing additional financial support as we have used nearly all of our non-retirement reserves during our time here. We truly look forward to your many bright smiles and warm hugs as we are grateful for the privilege to greet you once again. Please call, message or email us so that we can arrange to meet up with as many of you as possible. We look forward to seeing you very soon!! Posted on June 18, 2017 by John Lage, Jr. Yesterday was Father’s Day in Guatemala, today is Father’s Day in the US. Yesterday, my son gave me the best Father’s Day gift I’ve ever received. It was a surprise to him on Saturday but I knew about it the day before. How can that be, you might ask? On Friday morning, the director at John Edmund’s school started to text Jan and I about attending the graduation ceremony for the two 2017 graduates, neither of whom we know. There was more to those texts but be patient, I’ll get there eventually. He asked us to be there but not to tell John Edmund we were coming. We readily agreed. It turned out that this small graduation (about 100 people attended) was the best and most moving graduation ceremony any of the three of us had ever seen. Because the graduating class was only two boys, almost anyone that might have wanted to speak, got their opportunity to do so. Because the school is an international school and teachers do come and go more than in a normal US school, these speeches included videotapes to the young men from former teachers in Spain, Canada and the US. Three of their current teachers talked about them, as did the school director, as did each of their mothers and fathers. The graduates themselves each got to say what they wanted us to hear including a song from one of the students and a poem from the other in both Spanish and English. Each boy presented flowers to his mother. But none of that concerns the surprise gift (for him, because the teacher told us in the texts) my son gave to me yesterday. He was honored as the first ever recipient of the Atitlan Multicultural Academy (AMA) Volunteer of the Year award for his work with Information Technology at the school. It made Jan and I so very proud as you can see in this picture. Thanks, son, for the best Father’s Day gift you could have given me! Posted on February 24, 2017 by John Lage, Jr. In the chaos of the world these days, I have been struggling to find words to convey my thoughts and emotions in appropriate ways that don’t alienate that who may disagree with my progressive spiritual and political views. As I thought about this earlier this morning, I remembered a email folder named favorites where I put items from my devotional sources that really speak to me. I receive emails from at least 4 sources every day. Recently, I haven’t read them as faithfully as I should but maybe this idea that came to me this morning will help me to revive this habit. I am going to start posting links to these quotes and devotional materials on a regular basis on a new section of this site called “Spiritual/Devotional Favorites”. Since my words don’t seem to be coming to me as often now, I hope these quotes inspire all of you, as well as me, to more fully embrace the spiritual habits that help us to live in God more fully. Posted on December 24, 2016 by John Lage, Jr.
We will not be spending the holidays this year with all of you whom we love in the states, but we will not be alone. Instead we will be here in Guatemala where God calls us to be. Our hearts and our thoughts are with you but also with those here who have so little but teach us so much about how much more important relationships are than things. This Christmas season, I am reminded that God IS with us…always…through the good times and the bad. God loves us…always! God is LOVE always. God called Jesus to be our example of how to live in obedience to God, to show us how one person can change this world through love for all those around him! It’s amazing when you think about it. Our lives and our prayers are similar to yours in many ways. Here are some of the things that have been in our prayers this year. A new school for John and awesome PSAT scores. Many improvements in the accounting/financials at Salud y Paz through Jan’s gifts and graces. How do we as citizens find meaningful and positive ways to support our president when so many of his values and ideas violate our Christian principles? We pray for our country and our world. How do we live out God’s vision for our lives? Are we where we are supposed to be…today? John was bitten by a dog in November. With more than a little effort from a number of people, he received the needed treatment. We love you and we miss you all! We pray that you may feel and recognize God moving in your life today and always! You…are a child of God! Posted on December 20, 2016 by John Lage, Jr. This is an article I wrote for our church newsletter with some minor additions near the end. Christmas is nearly here. That period of the Christian calendar when we celebrate and remember those moments when God’s sent the world the gift of Jesus, his son. I spend a lot of time thinking about Jesus, about what his “becoming human” meant and what it means for us today. I think about what he knew about God’s plan for his life…and when he knew it…and how he came to know it. Was it crystal clear to him because he was God’s son or did his “becoming human” mean that he had to go through the same processes of discernment and experience the same struggle to understand what God was asking of him as we do? I think about what God’s purpose in sending Jesus really was? Was it, as so many believe, so he could become the ultimate human sacrifice and pay our debt to God for our sins against God? Was it, through his words and deeds to give us an example of how we should live, of how we should treat others, to show us how difficult it can be to live our lives as God would want us to? I don’t have all the answers to these questions and I find that my answers don’t always match up with what the authors of the Bible wrote. To some, that qualifies me as a heretic and non-believer. To others, I am a searcher for truth in my journey through life. To me, I am a follower of Christ trying to understand and live out all that this means. As a part of its budget process, the leaders at Christ UMC recently asked us a number of questions about our mission, its purpose and what value we provide. These are good and appropriate questions, but can also be very difficult questions to answer especially as we serve in primarily administrative roles. Some of them are as hard to answer as my never ending questions about Jesus. In the past two months, I have had the privilege of “being present” for at least three events which helped me to understand more about an incredible gift of “being present” that we give and that we receive serving as missionaries. The first event was turning over the keys to a new house (that Salud y Paz built with the help of hundreds of donors and volunteers including us) to a lady who is a battered wife, who has 6 children at home, who was living in a single shack of about 9×9 feet with a dirt floor and an open fire, while her husband slept in his mother’s more sturdy and sheltered house a few yards away. Their pride and excitement in their new home was obvious. They dressed in their best clothes and served those of us who were blessed to be there a meal. The second event was the opportunity to take the wife of our operations director to the hospital for her radiation treatment while he attended the Guatemalan equivalent of high school graduation for their oldest son. Spending time with God thinking about what she must be feeling during this long day away from those .The third was the celebration of the 15th anniversary of Salud y Paz. This was celebrated with and in the community of Camanchaj where our main clinic is located. My thoughts turned to all those thousands of people who had been helped by the organization in that 15 years. Thinking about these three events continues to touch me deeply, reminding me that for those involved, receiving a home, a ride or medical care can be a life-changing experience. An experience that that is only possible because others chose to “be present” in their lives and in their country. I think Jesus tried to teach us the importance of the gift of “being present” as a key ingredient to living a God-centered life. He attended weddings, shared meals, lived life and served those around him in so many ways. Jan, John Edmund and I would like to thank each of you for your continued “presence” in our lives through your financial support , your hugs (both physical and long distance) and your prayers. Without your “presence” in our lives, we couldn’t “be present” here. Merry Christmas! Returning to the US for a visit. Are you ready, Michigan – Indiana – Rochester? Posted on July 24, 2016 by John Lage, Jr.
We will be returning to the US for a visit on Tuesday, July 26. We will spend a day in Rochester and then will go to spend some long awaited time with our families in Michigan and Indiana for about a week. We plan to return to Rochester on August 4 and will be there until August 18th. We are eager to see as many of you as possible during our visit. We will be in church on the 7th and the 14th. If you’d like to make some plans to see us, let us know. We owe all of you an apology for our lack of written communication during this most recent stretch in Guatemala. The last seven months have easily been the busiest that we have had since arriving in Guatemala. We have clearly been doing God’s work, working closely with those around us to meet some important milestones while also facing some situations that have weighed very heavily on our hearts. Much of what we could have said would have escalated tensions within relationships that are critical to the Salud y Paz ministry that we support here. So we chose not to share. 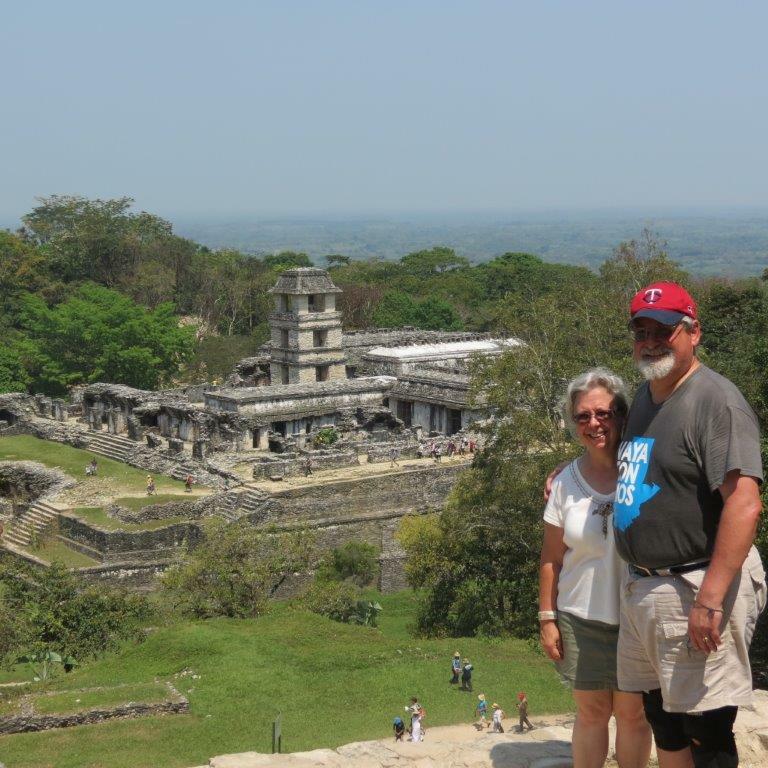 The high points include the CUMC team trip in January where 500 hundred patients were seen during a week of work dedicated to serving God and the Guatemalan people. Semana Santa (Holy Week) was a favorite for us again this year. Jan and I worked on the pharmacy system (more about this later) during most of the days during Holy Week and still got to see many of the native traditions at night and on Good Friday. lived until you’ve spent better than 13 hours each way in a public Guatemalan microbus with these two. We laughed lots, occasionally slept and Pakal-ed incessantly. Pakal was the most famous of the rulers in Palenque and we used his name to loudly call to each other and as the basis for a huge number of puns. 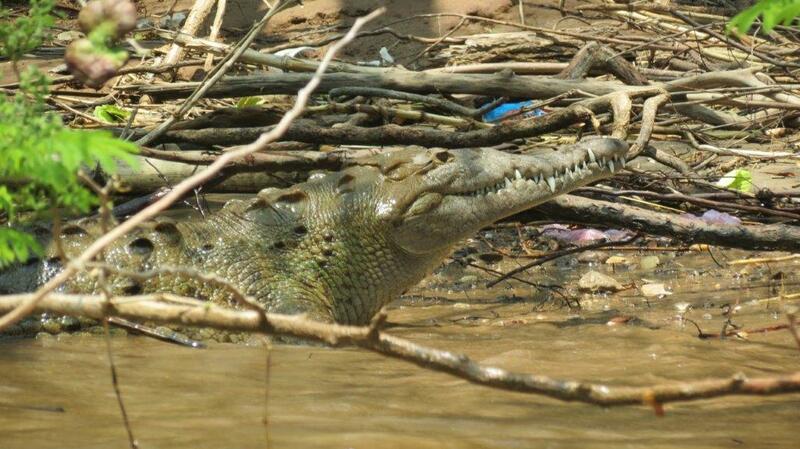 We took a modern boat trip one morning down a famous canyon where where we saw crocodiles, spider monkeys and coatimundi. 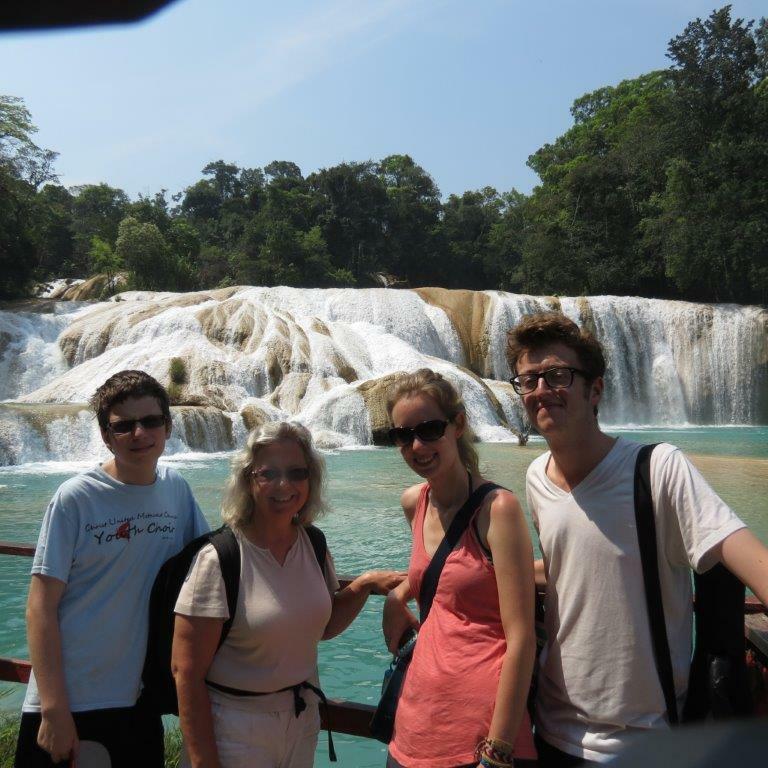 That afternoon we visited a well-known series of waterfalls and pools naturally tinted bright blue. The scenery was breathtaking. Our work life has been busy and exciting too. Jan has worked hard with other members of the administrative staff to improve the financial accounts and banking processes. She was able to celebrate the closing of the books at the end of one month when for the first time since we have been here, the person who reconciles the bank accounts had no additional questions for her. As for me, the pharmacy system I had been working on for almost a year went live in May. It has been a real success, providing some important benefits to the organization almost from its very first moments. If you ask me about it when you see me, I’ll try not to get too carried away with the stories. When it comes to the hard moments that I can talk about, a fairly large number of our closest friends here have left Guatemala or moved to other parts of Guatemala. These include Hannah, Laura, and Max from the United States and our Guatemalan doctor friend Susy De Paz, her husband David Cruz, and their kids, Isabela, Susan, and Jose. We played cards and video games together, made music together, worked and worshiped together as well as loved, laughed and learned together. We miss them all so much. Luckily we will see most of them soon. Laura and Hannah are coming to my parents house in Greencastle, Indiana to see us a week from Tuesday and we are planning to visit Dr. Susy and David in Xela, Guatemala’s second largest city when we return here. Through the good and the bad, we have been buoyed up by your prayers, your support and best wishes. God has been with us through it all, continuing, , as always, to be our Rock and our Foundation. May you feel and recognize God moving in your life, today and always! 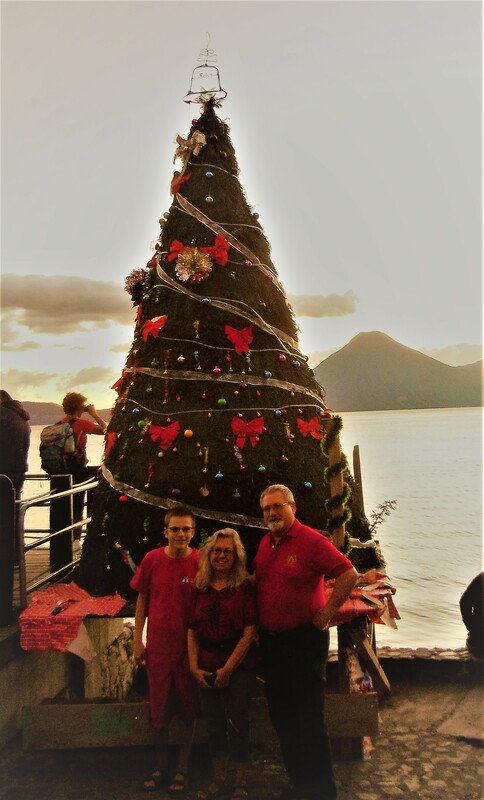 By the time you read this, we will be back in Guatemala after a precious visit with friends and family for most of the holiday season. The CUMC team will be here for their 12th year of mission with the people of Guatemala and Project Salud y Paz. It will be an exciting and busy time. The joy and honor of hosting the CUMC team has been something we’ve looked forward to and it is very important to share God’s call for us with this team. Please, keep the CUMC team in your prayers as they once again serve the Guatemalan people. Pray that they can clearly see God’s vision for each of them in their individual lives through this trip. I know that it can happen! We are nearing the end of our first year here in Guatemala and it feels like we have only just begun. We are deeply grateful for all of you who have been supporting us with your thoughts, prayers and gifts. We are blessed. Please keep us in your prayers as we follow God’s call on our journey here. Pray that we continue to see, hear, feel and know God’s guidance in our service throughout this second year. There is so much that we can accomplish with God’s and your help. If you are called to donate to the Lage Family Mission, there are two easy ways to do so. You can donate online through the General Board of Global Ministries. Here is the link: https://secure3.convio.net/gbgm/site/SPageNavigator/gbgm_donate.html?type=1001&project=982465 Click on the drop down menu to highlight John and Janice Lage and enter your donation. There is also an option for a recurring donation should you be called to use it. Another way to donate is by mail. Please put “Lage Family Mission” in the memo line of your check and send it to: Christ United Methodist Church, 400 5th Avenue SW, Rochester, MN 55902. They will pass it on to us. Thank you for your support in all you do! We truly feel your thoughts and prayers.